Answer: Exterior shop area walls are 2X6 stud construction, headed shop area walls are ICF construction. Question: WHAT SIZE ARE ALL THE ROLL UP DOORS ON THIS BUILDING? Question: How tall is the center door? 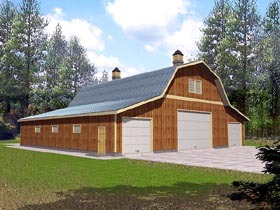 Answer: Center garage door is called out as a 18' W X 12' H overhead garage door. 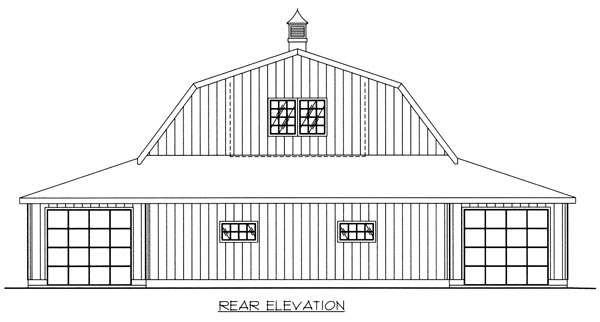 Answer: Hello, Heated work shop is 14' and loft is 8'-7 1/2". Answer: The heated shop has 14' ceilings. Thank you! Question: What is the load rating of the loft floor as designed in lbs..square. foot? Answer: 40 lbs live 10 lbs dead PSF ... can be adjusted up by using a larger bottom chord on the truss. Question: What is the ceiling height at the peak and low point in the loft attic? Answer: 8' at the low point... 8'-7" at the high point. Question: Was wondering (since no posts are shown) what kind of support is there in the heated shop area? Is there an I-beam running down? Thanks!